I was digging around in some of my research notes for my efellow research and came across some graphs I had sketched in order to visualise my thinking on the topic. I never actually used these in my research report but thought I would tidy them up and share them here anyway with the possibility they may help others to conceptualise some of the thinking required around eportfolios. This graph is pretty self explanatory really. 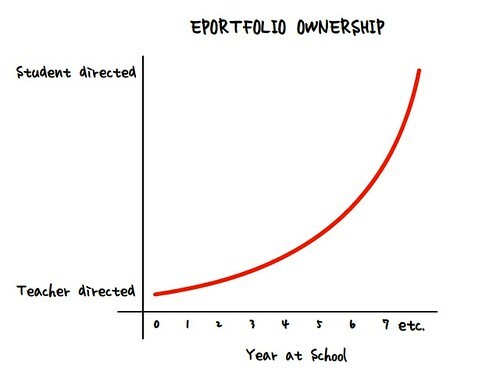 Essentially it suggests that the younger the student, the more teacher directed the portfolio will be. Generally, the teacher will dictate/suggest learning to share in the eportfolio, direct reflections and self assessment and more than likely do significant uploading and formatting of content. As the student matures and takes control of their learning, their ability to independently select, upload, reflect and set new goals for learning becomes less guided and increasingly integral to the way they learn. The process is facilitated by the teacher who supports the learning through providing rich learning experiences, opportunities for reflection and by giving feedback. 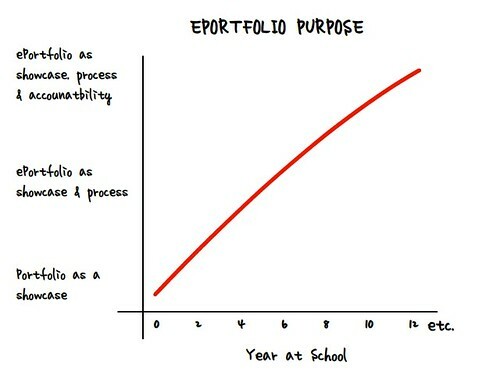 Closely related to the first graph, this one illustrates the changing nature of the portfolio’s purpose. My thinking at the time was that the portfolio for young students is essentially a vehicle for showcasing what the have done, finished examples of learning that show what they have done. As the student gets older the portfolio transforms into a much richer space that becomes part off and includes evidence of the process of learning such as goal setting, reflections, finished and unfinished work and feedback. As the student moves on to secondary and higher education the portfolio can also be used for accountability and assessment of achievement. I am not a big fan of this purpose but don’t have a problem with it as long as the formative/process benefits of the portfolio are not lost in its use for accountability. Hopefully that is helpful. At the same time I drew these I also sketched some graphs to do with inquiry. I will share those in my next post. Nick, graphical visual and self-explanatory – they say what we have been thinking. Well designed and they speak volumes. As children move up through the school they have greater ownership and accountability with their portfolio and what is included. I would also say (and I think you agree) that ALL learning should be shared in a portfolio (whether digital or paper), whereby creating ownership and engagement at a younger level, where children are fully immersed with their learning. Great graphs, well done.